Battery maker A123 Systems Inc. will supply lithium-ion cells to SAIC Motor Corp. for use in an electric vehicle as the U.S. startup expands ties with China's largest domestic carmaker. Cells made by A123, part-owned by General Electric Co., will be integrated into battery packs for Shanghai-based SAIC at Advanced Traction Battery Systems Co., the companies' joint venture, A123 said in a statement. The car, due in 2012, will have a range of about 100 miles between charges, said Jason Forcier, vice president of A123's automotive group. The battery maker didn't say how many vehicles will be built. The U.S. battery maker aims to boost business in China further after previously announcing plans to supply cells for SAIC's Roewe 750 hybrid and Roewe 550 plug-in hybrid sedans. China, the world's largest auto market, is offering buyers of plug-in hybrids and electric cars subsidies of as much as 60,000 yuan ($9,000) to help cut pollution and reduce oil dependency. China will be the biggest market for electric vehicles “for a couple of reasons,” Vieau said. Chinese government officials estimate electric-vehicle production in the country may reach 1 million units a year by 2020, A123 said. China will have as many as 20,000 plug-in hybrids and electric cars by 2013, Wan Gang, China's minister for science and technology, said last week. Others estimate demand will grow more slowly. Researcher J.D. Power & Associates forecasts that Chinese consumers may buy 432,000 plug-in hybrid or electric vehicles in 2020, out of a total of 5.2 million globally. Electric and hybrid vehicles may account for 7.3 percent of global auto sales by 2020, or 5.2 million units, and China will account for less than 9 percent of the total plug-in hybrid and electric car demand by 2020, according to J.D. Power. A123, based in Watertown, Mass., will initially ship cells made at its battery factory in Livonia, Mich., for the electric car, before a China production line opens in 2013, Forcier said. He didn't provide financial details. SAIC will introduce the Roewe 750 gasoline-electric model in December and Roewe 550 plug-in hybrid at the end of 2012, said Judy Zhu, a Shanghai-based spokeswoman for the carmaker. 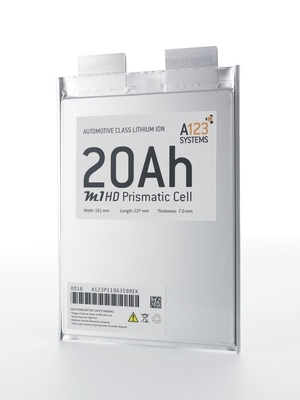 A123 and SAIC announced their joint-venture battery company in December 2009. The Chinese automaker holds a 51 percent stake in the venture with A123 holding the rest. 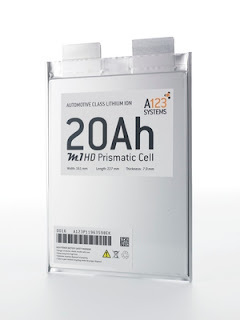 A123 also supplies lithium-ion batteries to Bayerische Motoren Werke AG's BMW, truckmaker Navistar International Corp. and Fisker Automotive Inc., a maker of luxury plug-in hybrid sports cars.